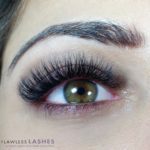 Eyelash Extensions at Flawless Lashes are fully customized, and individually applied to each of your isolated eyelash hairs. The extensions do not touch the skin, and since they are on one isolated natural eyelash, as your natural eyelashes grow and shed, the extensions grow and shed along with your lashes, not causing harm to the natural lashes. Proper application is critical for a good eyelash extension experience. All of our lash stylists are properly licensed, and trained to give you a beautiful result that is healthy and sustainable for your natural eyelashes to wear. Flawless Lashes eyelash extensions stay on 24/7, are waterproof, and replace the need for lash curlers and mascara. The first appointment takes about 2 hours, and touch ups vary from 1 hour to 1.5 hours depending on how much time has passed between appointments. 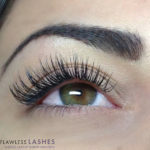 With 6 curls to choose from, colored lashes, multiple lengths, thicknesses, and techniques available, your Flawless Lashes stylist can help guide you in choosing the perfect type of lash extensions to suit your desired outcome and lifestyle. Classic Eyelash Extensions are the original eyelash extension that involved applying one single eyelash extension to one natural eyelash hair at a time. Natural Volume Eyelash Extensions are highly customizable as a small fans of up to 4 extensions are hand crafted with a special fine diameter extension, and then applied to each of your natural eyelashes. The benefit of volume lashes is that they can create the illusion of more eyelashes, but they weigh slightly less than wearing classic eyelash extensions. Soft, fluttery, our natural volume lashes are noticeable, but natural. Full Volume Eyelash Extensions are for the client who wants a little more than natural, yet not full on glamour- our Full Volume eyelash extensions are the best of both worlds. Soft, hand made fans of up to 6 very fine extensions are applied to each of your isolated eyelashes. This replicates the look of eyeliner and mascara, giving you the ability to have full, lush lashes 24/7. 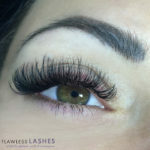 Ultimate Volume Eyelash Extensions are for our clients who want extra glamour. A small fan of up to 8 extensions are hand crafted for each of your natural eyelashes using specially made extensions that are as thin as a strand of hair. Using this thin of an extension allows us to create the fullest amount of lashes possible for you, while still remaining lightweight, soft, and flexible.